It's always interesting to see if my weekly thought about joining an Optimist Club has legs. In other words, which one of my pithy little statements will be shared and shared again on Facebook? 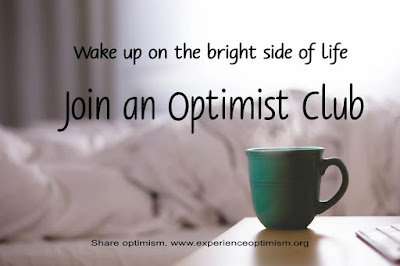 I posted this particular thought (Wake up on the bright side of life: Join an Optimist Club)during the Optimist International Convention and sure enough, it went from coast to coast as Optimist Club members from North America shared it with their own Optimist Clubs. Most know that the Optimist Creed tells us to "Look at the sunny side of everything and make your optimism come true." If you are striving to do so, it is inevitable that you will wake up with a sunny disposition. I also believe that if you know you have friends who are striving to do the same, you'll try even harder to make your collaborative promise come true. One of my favorite things about being an Optimist Club member is reciting the Optimist Creed with others. It's a powerful promise when we say the ten resolutions to ourselves each day, and when we say it together, it rings with action. If you enjoy having a positive nature, and who doesn't, I encourage you to share optimism and join an Optimist Club today. Click here to find an Optimist Club near you or contact me. I would be happy to help you start a new Optimist Club in your community. My Experience Optimism post today comes from a sister service club - Kiwanis - and while this charming little house was built by the Kiwanis Club of Fircrest, Washington, any service club can do it. What is it? A small lending library. Sitting on the corner of Fircrest Park, this cute little house encourages readers to take a book and leave a book as often as they wish. While you may not need to affiliate in order to create a library in your community, this lending library is a chartered member of the Little Free Libary. By affiliating with the organization, you get your name on the online map plus the support and ideas of other neighborhood libraries around the world. They will also send you $150 worth of free books to help you get started. I like this project because it impacts local neighborhoods directly and provides a great way to keep real books in our hands. 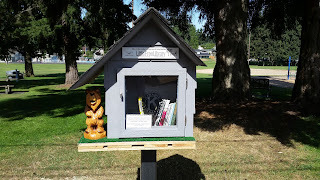 It's not terribly hard to build and maintain; you can find some plans here for building your Little Free Library and tips for marketing your library once it is established. There are also suggestions for working with your local park, neighborhood association, or other venues for locating your Little Free Library. I'm going to encourage my Optimist Club to build one at the next meeting. Why don't you? The final business session of the 2015 Optimist International Convention has come to a close. New Optimist Club builders have been honored, district leadership teams have been recognized, business has been conducted and inspiration has been shared by the Ken Garner, Optimist International President 2014-2015 and Dave Bruns, Optimist International President 2015-2016. As we return to our home clubs and our local communities where the impact of our work is personally delivered and felt, we do so with a renewed sense of purpose. Optimist Clubs have been bringing out the best in children for more than 10 years. Starting right here, right now, we'll also bring out the best in our communities and ourselves. I'm looking forward to it. Won't you join me by joining an Optimist Club today? Did you know that Optimist Club members are happier giving away money than the groups that receive the assistance? Sometimes, and that certainly looks true in this great picture captured by the Halton Hills Optimist Club. 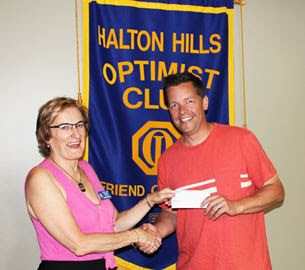 In the photo, President Helen MacCormack presents a check for $1,570 to Jason Claringbold of the Halton Hills Mosquito Eagles Baseball team. Helen knows that her club's donation is helping young people develop into well-rounded adults by learning teamwork, sportsmanship and improving their physical wellness. More important, she knows that she and her fellow club members are serving their purpose of providing service to youth and community through the Optimist Club. That makes me smile too! How about you? Photo courtesy of the Halton Hills Optimist Club.